Blankon is one of popular ubuntu based distribution that developed by Indonesian Linux Mover Foundation and BlankOn developer team. In their latest release, Blankon (Blankon 7 code name Pattimura) bring something difference that called BlankOn panel. BlankOn panel is a default application launcher in BlankOn, unlike some alternative menu launcher (MGSE, Mate, Cinnamon, etc) which concentrate its appearance so closed to Gnome 2 look, BlankOn panel give a completely different looks but it's great! see following screenshot. Actually, I want to try this a long time ago, but just realized at this time. Before we can install it in ubuntu, we should add following repository to your package list (/etc/apt/source.list). You can try run BlankOn panel via terminal, by type `blankon-panel`, see the ubuntu logo at the top left corner of your desktop (in a line with gnome panel) there's a way to BlankOn panel. Once i run it, it was look not so neat, because it's dualism menu with unity launcher and sometimes blankon panel button also overlap with Global Menu so there make it does not visible, but yeah! it was not designed for Ubuntu. 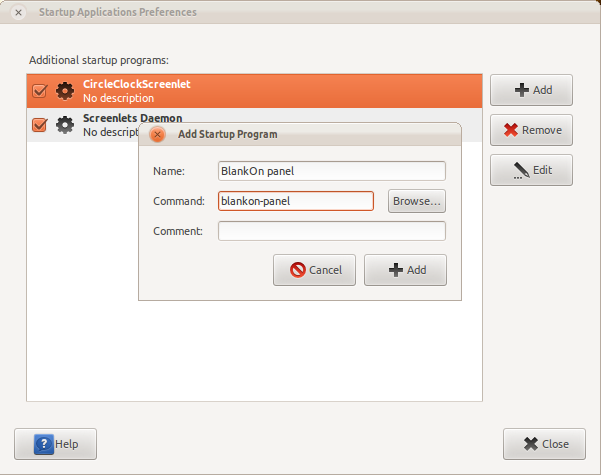 if you intend to use it permanently, you can add blankon-panel in your startup application list or even install BlankOn in your desktop. You can visit this links to know much about blankOn and BlankOn Panel.